A precentral reader happened to be on the freeway in Los Angeles when he noticed a trailer loaded up with two Mini Coopers. 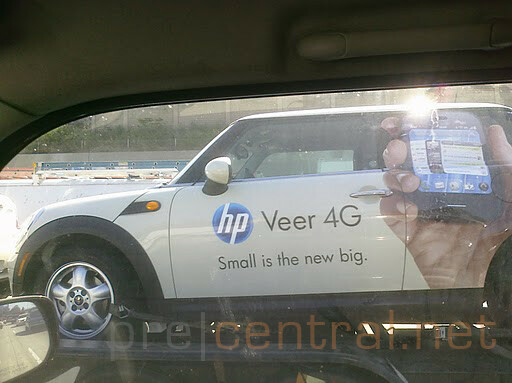 That alone might be enough to excite some, but more exciting for this gentleman was the ad along the side of the cars for the HP Veer 4G. 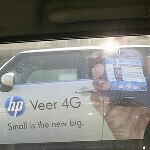 That's right, we said HP Veer 4G. The 4G tag makes sense since the phone is expected to be launched on AT&T where HSPA+ is 4G. Actually, when HP released an app for its retail sales reps last month called "Selling webOS", it listed the small, credit card sized device as the Veer 4G (that app has been pulled). In this day and age of 4.3 inch screens, the 2.6 inch screen on the Veer 4G might end up being a hard sell. HP is hoping that there is a market for such a small handset as you can tell from their tagline, "Small is the new big"
For those who really want such a small smartphone, the good news would seem to be that once you see the handset that you're dying for painted on the side of not one-but two Mini Coopers, a launch would seem to be imminent. 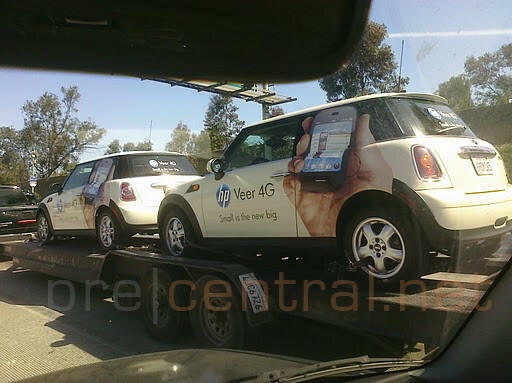 As we reported, the HP Veer is due to launch overseas next month, apparently as a 3G device. I heard there may be a drawing for these cars, I want a free car! It wouldn't hurt if it came with a cool new HP phone too!